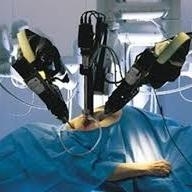 (HealthDay News) -- From 2003 to 2010 there was widespread adoption of robot-assisted radical prostatectomy (RARP), especially among high-volume surgeons, according to a study published online Aug. 26 in BJU International. Steven L. Chang, M.D., from Brigham and Women's Hospital in Boston, and colleagues evaluated data from 489,369 men who underwent radical prostatectomy in the United States between 2003 and 2010. The authors studied factors associated with adoption of robot-assisted procedures (>50 percent of procedures performed with robotic assistance annually). The researchers found that over the study period, RARP adoption increased from 0.7 percent to 42 percent of surgeons performing radical prostatectomy. The odds of adopting RARP were significantly higher among high-volume surgeons (>24 radical prostatectomies annually). Adoption was also more common among surgeons at teaching (odds ratio [OR], 2.4), intermediate-sized (200 to 399 beds; OR, 5.96), and large-sized hospitals (≥400 beds; OR, 6.1) from 2005 to 2007. For the period after 2007, adoption was more common among surgeons at urban hospitals (OR, 3.3). RARP was more expensive, contributing to the 40 percent increase in yearly prostate cancer surgery costs. However, over the study period, RARP costs generally fell and leveled out at slightly over $10,000, while non-RARP costs rose to almost $9,000. "The diffusion of RARP was associated with a centralization of care and an increased economic burden for prostate cancer surgery," the authors write.